As gum continued to decline in sales and cultural relevance, Juicy Fruit needed to find its place in culture to connect with a younger generation, and their iconic jingle wasn’t going to cut it. As an impulse buy, gum has traditionally been advertised with the intent of awareness and recall. 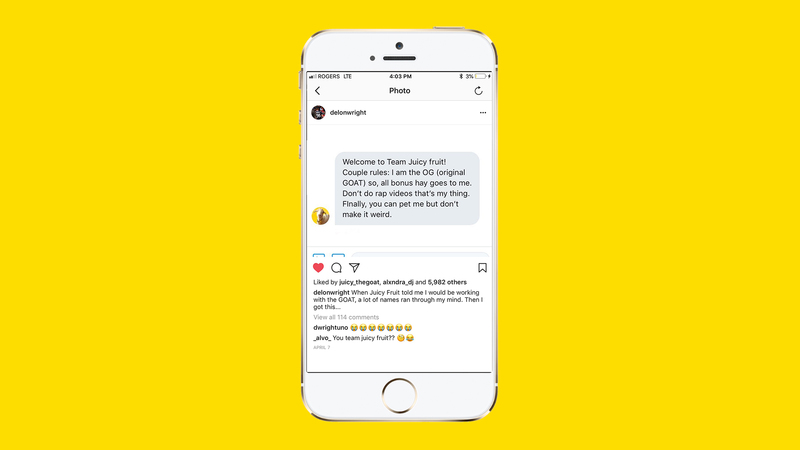 In the past, Juicy Fruit was focused on the functional benefit of “sweet,” but the brand needed to connect with their young target in a way that made sense in today’s context, since they were probably not familiar with Juicy Fruit’s past place in culture. Juicy Fruit had an existing partnership with the NBA and Toronto Raptors, and there was something to be leveraged to reach their young target. In sports, brands are everywhere, and the fans aren’t watching for the sponsorships. A connection with fans needed to be found to enhance their experience in a way that was authentic and ownable to Juicy Fruit. Mobile is the second screen of live sports, and NBA fans are active participants in the social conversation, so the brand decided to get involved in the biggest social media debate in basketball today: who is the Greatest of All Time? A.K.A. the G.O.A.T. For young fans, moments in sports are brought to life in the form of memes and GIFs on social media. Getting involved in online conversations is their version of instant replay. The NBA community loves to participate in competitive behaviour – especially from behind a screen. With so many superstars in the league at once, the online debate over the G.O.A.T. 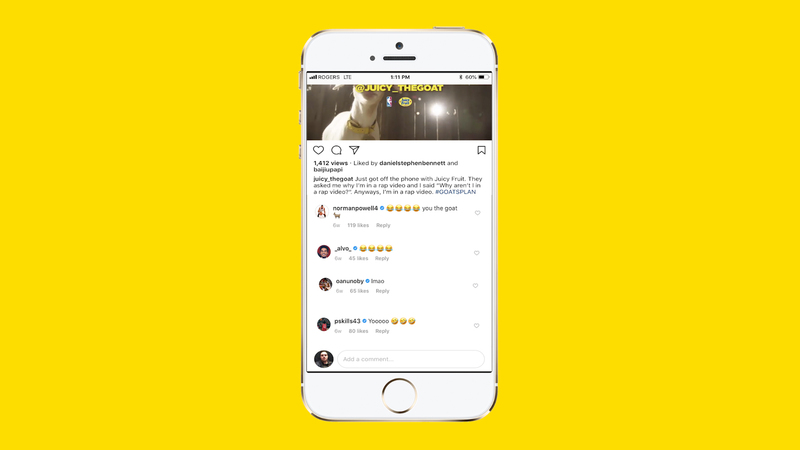 is never-ending, and Juicy Fruit wanted to shake up the conversation by introducing something that was true to the playfulness of the brand. The playful Juicy Fruit personality was introduced to the digital debate with the real G.O.A.T., Juicy the Goat – an actual animal, not an acronym. Other than being the go-to emoji when referencing the G.O.A.T. on social media, the goat was chosen because of their trademark skill – chewing. This made Juicy an ownable character for the brand, while keeping the playfulness of Juicy Fruit. With the act of chewing at the heart of anything he did, Juicy was the G.O.A.T. of gum. He established Juicy Fruit’s place in the cultural conversation of basketball, beyond a co-branded sponsorship. Juicy head-butted into the #GOAT debate with fans – he intercepted conversations on Twitter and Instagram, and hijacked online All-Star voting, claiming the votes as his own. 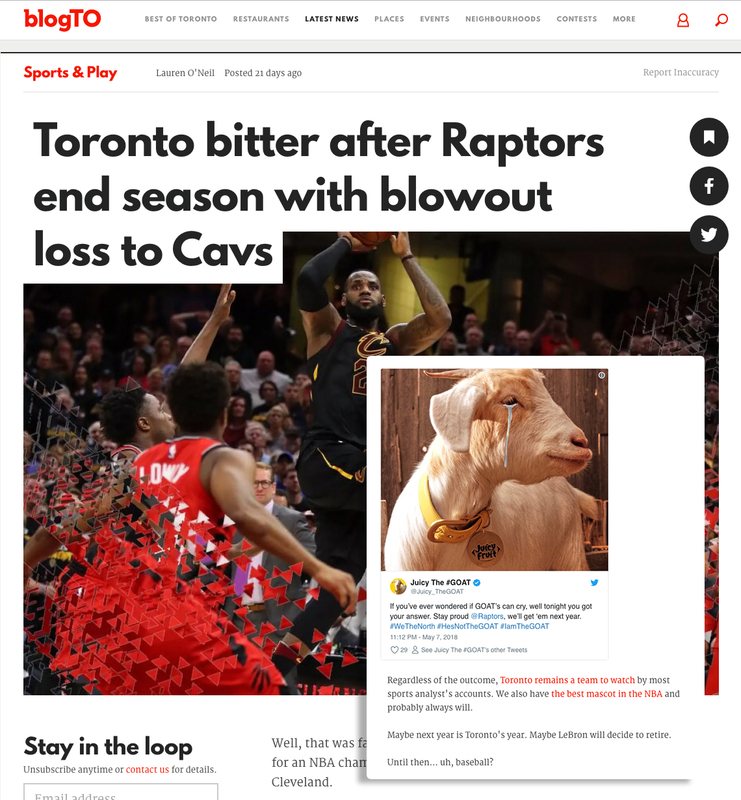 Over the course of the regular season and playoffs, Juicy the Goat engaged fans with relevant memes, #goativational messages, and a bit of lighthearted trash talk. To build Juicy’s fandom, an influencer campaign was launched and gained momentum during key moments of the NBA season. The influencers were a collective of basketball enthusiasts and pop culture meme accounts that the target was already interacting with, which helped establish authentic relevance for Juicy. As Juicy became more recognized in the online NBA world, voices surrounding basketball culture interacted organically with Juicy, with shout-outs, retweets, and interactions from Sportsnet, Nike, Footlocker, and New Era, to name a few. He even got some love from the Raptors players with organic interactions from Delon Wright, Pascal Siakam, Norman Powell, and Fred Vanvleet. To wrap up the playoff season, a TV spot was aired with fan favourite Delon Wright, where he screamed for the Raptors alongside Juicy and solidified Juicy Fruit’s new relevance for NBA and Raptors fans. 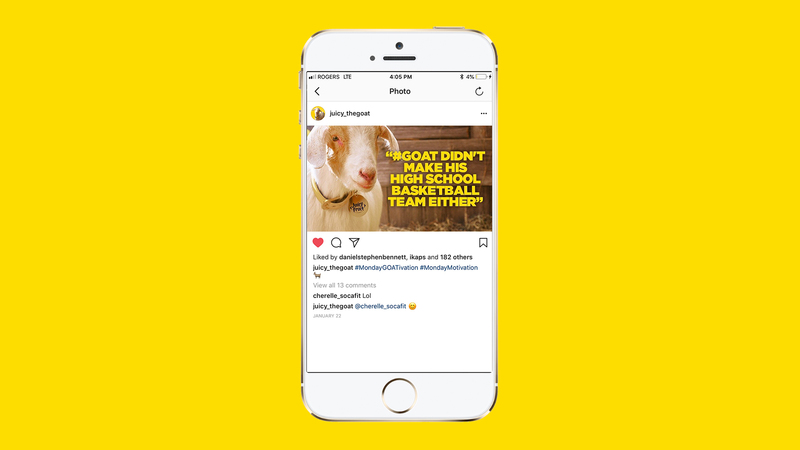 With Juicy the Goat, not only was Juicy Fruit’s place in culture established, but the campaign significantly moved sales in a declining category. Juicy the Goat helped the brand find a place in basketball culture. The campaign succeeded in making an authentic connection with the fans – the engagement rate doubled the industry average, at 5.2% with 97% positive sentiment. In the declining category of gum, Juicy Fruit sales increased by 16% with no change in spend from the previous year. Juicy the Goat became an icon in the online NBA community and established a direct connection with the fans, along with a new cultural relevance for Juicy Fruit. In the never-ending debate, Juicy will always be a contender for the #GOAT.